Laura Ellman spoke on a panel at the Coalition for a Better Illinois 6th‘ Healthcare Forum at the College of DuPage on Monday, August 6th. Laura joined healthcare experts and two other Democratic candidates to speak about healthcare concerns such as Medicare, Medicaid, women’s reproductive care, and ensuring access to affordable healthcare. 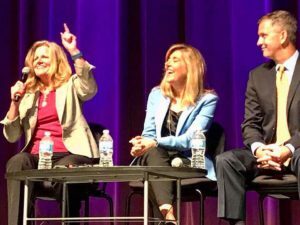 Laura, alongside Congressional candidate Sean Casten, discussed the importance of access to affordable healthcare and women’s reproductive rights. Laura also discussed her priorities of addressing shortages of care, backlogs, and insufficient resources for those seeking to navigate our complicated healthcare services. Illinois is responsible for implementing Medicare and Medicaid as well as caring for our elderly and people with disabilities, and she believes we must do better. For example, Laura is 47th in the country for people with disabilities. Laura wants to work to care for our loved ones and invest in our communities to help Illinoisans thrive and reach their potential, rather than seeing healthcare as a place to cut costs or make profits. Some policy items Laura supports are increasing pay for home healthcare providers to decrease shortages, paid family sick leave, lowering prescription drug prices by taking on big pharma, and enforcing higher standards for the state to provide appropriate care and help those on waiting lists for needed services. The incumbent Senator Connelly was invited but chose not to attend. Connelly has a history of voting against healthcare coverage for low income children, voting to cut Medicare and Medicaid, and voting to restrict women’s access to reproductive choices.